The Caribbean Coast. The surfing season on the Caribbean coast is short-lived, since it is the storms off the Mexican coast that create the swell that surfers love. However, these waves are some of the biggest in Costa Rica, and it's recommended only for veterans. One of the vibrant surfing towns on the Caribbean, Puerto Viejo, is known for its enormous waves, including the world famous "Salsa Brava" reef break, howler monkeys, reggae and a healthy dose of natural spirituality for visitors who want to change their life. The North Pacific Coast. The North Pacific coast's Guanacaste Province receives the most number of visitors because of its great and easily accessible dive and surf spots. One of the best breaks in Costa Rica is at Playa Naranjo, which is also known as Witch's Rock. If you are a beginner, the Witch's Rock camp is a great place to put up and learn to surf. Remember that this region is also one of the least populated parts of the country, so you cannot expect luxuries. The Coast of Playa Grande. 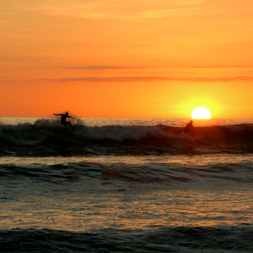 The region of Playa Grande offers surfs and swells that are consistent, quieter than popular beaches like Tamarindo, and it is also great for swimmers. The northern side of the beach is where the surfers don't go, so swimmers can haunt the waters without colliding with surfboards. Playa Negra is a fantastic right-handed point break. The waves are reliable and powerful. If there's a storm, you'll find veteran surfers rushing to the area to tackle some aggressive surf. The Central Pacific Coast. The Central Pacific coast is most easy to access in all of the country. It's near San Jose, having a bit more nightlife than other places, and a resort-town vibe. Boca Barranca beach on the coast offers some of the country's longest rides, for as long as half a mile if the conditions are right. It can get crowded however, so come early to avoid the crowds. High tide offers the greatest surf. The South Pacific Coast. The South Pacific Coast still retains some rainforest cover, so you can surf against lush green landscapes no matter what skill level you are. Playa Dominical is a good beach for everyone, with veterans finding bigger surf to the north, at the mouth of the Baru River. Pavones, 8 hours from San Jose, is another left-point where surfers can enjoy one of the longest rides at three quarters of a mile. Surfers usually stay the night in makeshift camps, and surf is ideal from April to November. One of the best ways to experience surfing in Costa Rica is by staying at a surf camp. Most surf towns such as Santa Teresa, Jaco, or Tamarindo will have several to choose from. At these surfing retreats, you'll have a professional instructor take you to great spots for beginners depending on the daily conditions, and you'll be standing up on the board much faster than if you just "wing it" on your own. Many surfcamps offer yoga as well. If you are planning a surfing vacation, you should keep in mind that surfing in Costa Rica can make for a dream holiday. With isolated beaches, great swells, long rides, snorkeling, wildlife, cowboys, laid-back reggae and churros for dessert, there is not much that the country doesn't offer to those that love a nature-filled adventure.